Yes, the 1st and 2nd runnings of the Gleneagles Challenge did start and finish from my garage in the Gleneagles Subdivision of Cary, NC. Last year I expanded it to a Bond Park pavilion and this year graduated to the big leagues with the Gleneagles Challenge 2010 being a Bushwhack Adventures production and part of the Checkpoint Tracker Series. For locals who have done a GEC in the past, you'll still find some things you've seen in the past (climbing up trees and going into tunnels). Marcey and I recently completed the initial coursework and Pat and Don will vet the course soon. 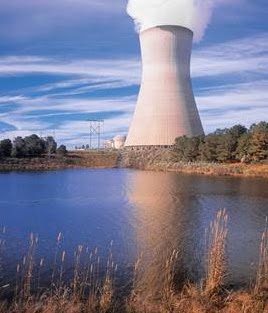 The course will almost be completely Rogaine allowing many options for fun, fast single track mountain biking, paddling in the clear blue waters of Harris Lake with a Nuclear Plant looking down at you, and trekking through some dense pine groves. The GEC 2010 will be a great race for beginners and will challenge experienced racers to clear the course. And since copyright laws proclude us from using the old GEC logo, I "borrowed" from the 5-Star Gleneagles Luxury Hotel and Country Club in Scotland, we are introducing the new GEC logo for 2010. Register soon and we will see you at Harris Lake. 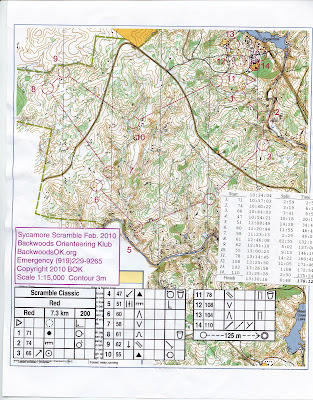 Bob competed in the Backwood Orienteering Klub's "A" Event, the Sycamore Scramble on Feb the 2nd. I only participated in the Classic Red 35+ Course on Sunday, but wish I could have done the Sprint and Middle courses on Saturday as well. The weather was picture perfect, clear blue skies, and a very slight nip in the air. This was my first O'Meet at this level, so didn't really know what to expect, and arriving about 15 minutes prior to my 10:35 start time did not help getting fully read in and prepped. After registration and receiving my Finger Stick, I was put in a series of chutes to control the start. 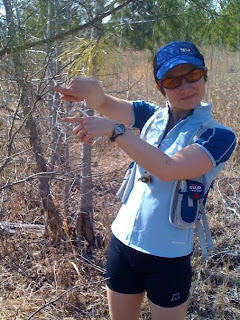 On the starting whistle, I was able to see the map for the first time and headed on my way - at a slight gallup through the woods. Things were going great until Control 8, where I completely missed it by a country mile and ended up out of the Umstead Boundary near the RDU 286 Rogue MTB Trails. I'll blame it on using a different compass than my old standby military issue compass and not paying attention to terrain, second guessing myself, and not listening to the little voice in my head saying "You are all jacked up". Anyhow, I first decided to ditch the point, but after seeing Kevin and Marcey riding their bikes on the Reedy Creek Trail and cheering me on....I decided to stop feeling sorry for myself and took a second stab at it. This time using pure terrain association and following the spur down to CP 8. Total time from CP 7 to CP 8 - 83 minutes, ARGHH!!! The rest of the course was fine except the support crew was picking up CP 11 before I got there and I had to punch it while he was holding it - making me think that CP 12-14 were already being picked up as well. Not the case, so the easiest CPs around the Sycamore Lake Cabins also took me way to long to track down. Overall, it was fairly confusing, as it was my first attempt at a higher caliper O'Meet and is set up very different from BOK's normal events. The race was extremely well put together and the support was phenomenal. I ended up taking just under 3 hours for a 14 Control, 7.5km Course, finishing 6th in the Red 35+ Category.